True story: I have an addiction to smuggling things into movie theaters. It started as a small problem- My mom would bring us to CVS before seeing a movie and we would smuggle candy into the theater. Note, I said my Mom. My Dad tried it once and all the sneaking around nearly caused him to have a heartattack in the theater. We weren’t allowed to eat our smuggled items until all the lights went out and the movie started to cover the noise. I’m pretty sure even at 10 I was looking at him like he was nuts. But, the smuggling back then was ok because we usually bought popcorn when we got there. It evens out, right? Then, when I reached my teen years, I would smuggle in one of those ginormous bags that gets you free refills. I would go into the theater and about 10 minutes into the movie, I would pull out the popcorn bag and go to the snack bar and tell them I spilled it in the theater and needed a refill. But my smuggling really hit it’s peak a few years ago when me and a date smuggled in full sandwiches, chips and drinks into an after-work showing of Social Network. You know a dudes legit when he goes along with sandwich smuggling. Pour the popcorn in a bowl. 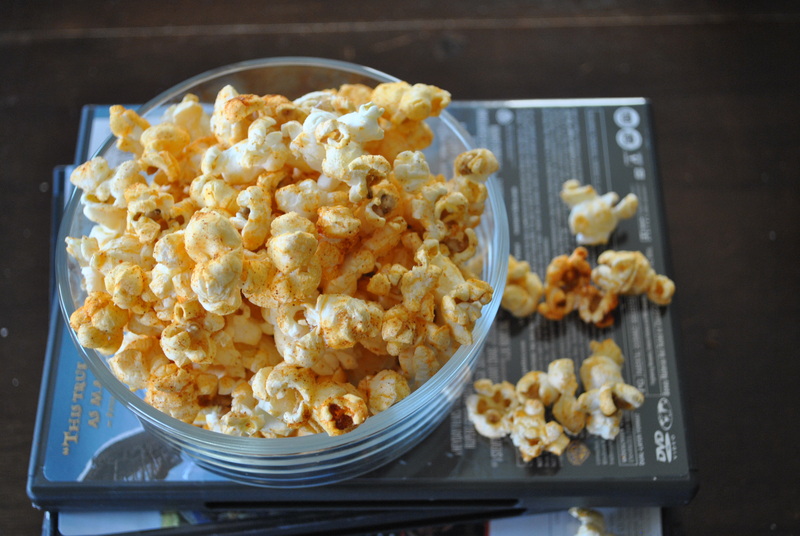 Drizzle olive oil on the popcorn and about 1/2 tsp each of the salt, paprika, onion powder and garlic powder and a bit of the cayenne pepper. Toss. Drizzle a little more olive oil and toss. Drizzle more olive oil and the rest of the spices. Toss and taste. Add a little more of whatever else you think you need (which almost always is more salt for me). 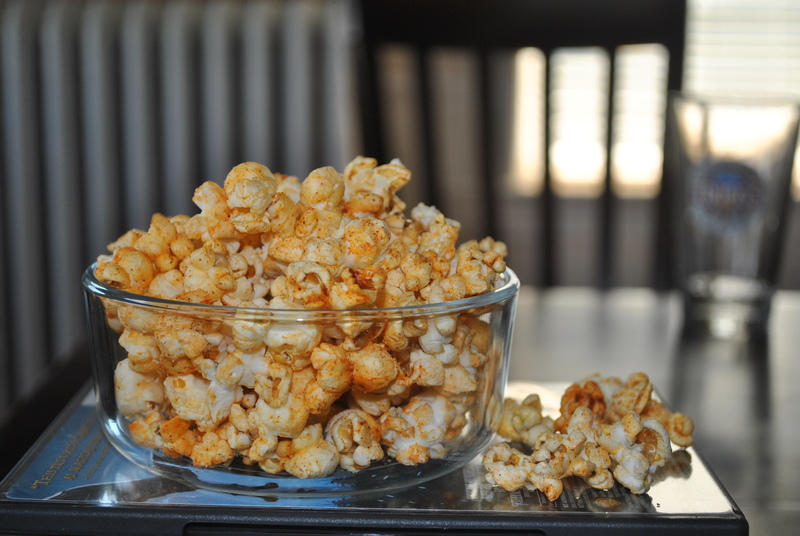 This is hands down my favorite popcorn I’ve made from scratch. The spices give it such a good flavor that you don’t even miss the liquid butter…or the 800 knapkins you need to wipe the butter grease off your fingers. Much thanks to Melinda for introducing this to me at the drive-in. I’ve found that I LOVE spiced popcorn..and smuggling things into movie theatres! 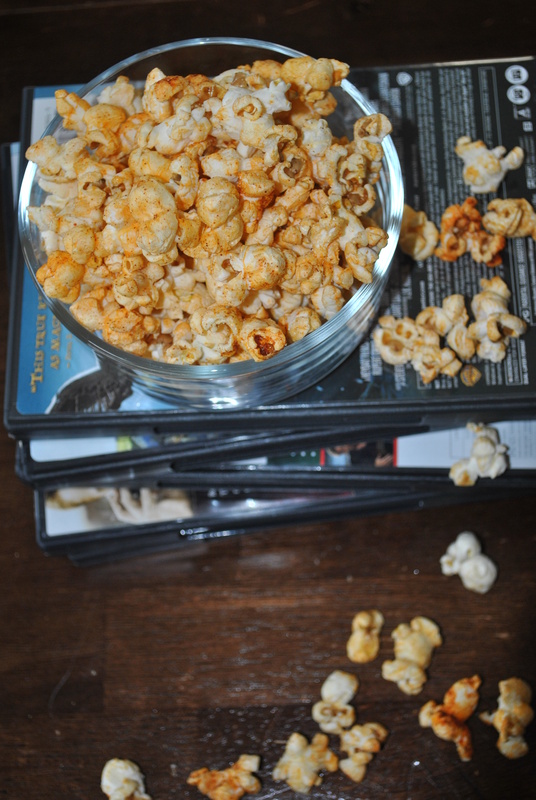 I seriously love making my own popcorn. Such a yummy snack!